In 1969, the Datsun 240Z was unveiled at New York City’s Pierre Hotel. It went on to become a sports car icon, marrying style and performance with reliability and affordability. Fifty years later, we’re a stone’s throw away in Central Park checking out the special-edition 2020 370Z Nissan is launching to mark the iconic Z car’s golden anniversary. But as Nissan celebrates the past, the Z faces an uncertain future. Making its public debut at the 2019 New York Auto Show, the 2020 Nissan 370Z 50th Anniversary Edition (to use its full name) wears a two-tone livery reminiscent of the BRE (Brock Racing Enterprises) 240Z race cars of the early 1970s. Racing was instrumental in getting buyers to take Datsun (as Nissan was known at the time) seriously. Japanese cars didn’t have the solid reputation that they have today. The 50th anniversary 370Z is available in black and silver or red and white (which is closer to the look of the original BRE cars) as well as 19-inch wheels with red accents. On the inside, the car gets seats with 50th-anniversary logos, dark chrome trim, and a model-specific Alcantara steering wheel with a red stripe at the 12 o’clock position, in case the driver forgets which way is straight. An eight-speaker Bose audio system and active noise cancellation are standard. Nissan didn’t make any mechanical changes, so buyers still get a 3.7-liter V6 making 332 horsepower and 270 pound-feet of torque. In proper sports car fashion, power is sent to the rear wheels through a six-speed manual transmission (a seven-speed automatic is also available). Nissan’s naturally aspirated V6 is becoming a rarity in an era of downsized turbocharged engines, and it’s also getting hard to find similar amounts of power in a two-seater at an affordable price. Nissan wouldn’t quote a price for the anniversary model, but we expect it starts somewhere in the mid-$30,000 range. It may be modern in comparison to the original 240Z, but the 2020 370Z is a bit of a relic. The 370Z debuted as a 2009 model, making it pretty old by auto-industry standards. The car’s age is immediately apparent when you sit behind the wheel. The 50th-anniversary model is based on the entry-level Sport trim level, meaning there is no infotainment screen to be found. That’s admittedly refreshing in a sports car, which is supposed to be all about driving, not technological distractions. 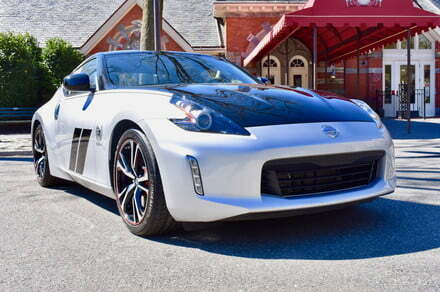 But it begs the question: How long can the current-generation 370Z hang on? Nissan won’t discuss future products, so it’s unclear when (or if) a replacement for the 370Z will arrive. For now, Nissan is happy to celebrate the past rather than look ahead to the future. The 2020 Nissan 370Z 50th Anniversary Edition is a worthy tribute to the original 240Z, not because of its spiffy livery, but because the 370Z itself is one of the last old-school sports cars.